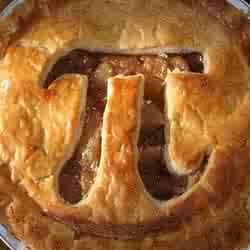 In case you didn't realize, today is every math nerd's favorite day.....Pi Day! Yes, today is 3.14159265....well you get the idea. Pi is awesome, fun and very nerdy. Take the time to celebrate those continuing numbers with your family and friends and to irritate your boss! I remember my first Pi day. I was in 6th grade, and we had a fun math teacher that had the whole grade gather to talk Pi. We all had to write papers about the history of Pi for a contest and mine won honorable mention! I know that doesn't seem like a big deal, but I was very anti-homework back then. It got in the way of my reading pile. Funnily enough, we even had ice cream cake that was shaped like 3.14. This is one of my most treasured memories, just because it was so much fun. If you think that walk down memory lane was cheesy, just think about this: Pi is not perfect, yet never ending. Sounds pretty profound, huh? Enjoy your very own slice of Pi today!